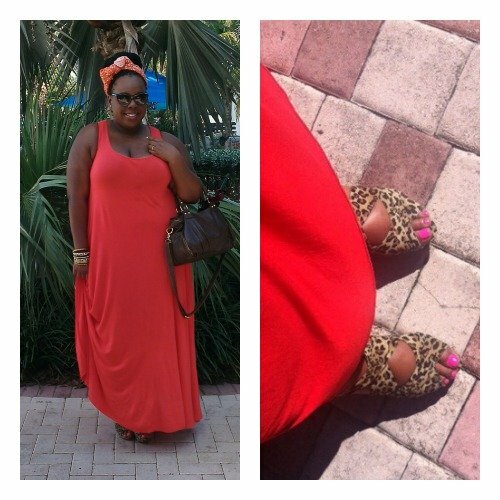 A lot of you were asking about the dresses I wore while I was in Miami earlier this month, here’s the rundown! Even if I’m going away for a weekend and am bringing three outfits, there is no way I could fit everything in one of those black square suitcases that people wheel around. My bras alone need their own duffel bag and if its winter and I’m packing bulky sweaters? Forget about it! I never realized that I probably pack for trips differently because my clothes take up more space. Little tricks like putting four pairs of socks into my bra cups to save space probably don’t come up for everyone but as a Plus Size Princess, things like that are second nature when I’m preparing for a trip. I’m not even going to mention the fact that I’m a high maintenance PSP because that means that I’ve got lots of creams, powders, tubes, trinkets and accessories that I have to pack when I travel, so my luggage will probably always need to be on the medium-large end even if I’m only going away for a few days. Its nothing to complain about really, I’m just fascinated that I didn’t realize this before. There are so many random things that come along with being a Plus Size Princess; we’ve got to combat chub rub or handle the sweat between our boobies or worry about the seatbelts on the plane fitting us. Now I’m adding “required to have roomier luggage” to the list. Everyone keeps saying that Summer is officially over, while I love the fall… I needed just a *little* bit more sunshine in my life before I surrendered to sweaters and boots. So last weekend I took off to Fort Lauderdale. First things first, I would warn all of you never to fly Spirit Airlines. I bought my ticket with them because it was the cheapest ($180). But I had no idea they would charge me $40 for any bags that didn’t fit under my seat! Even though my suitcase was small enough to be on the plane with me, I still had to pay the fee for each leg of the flight, so that totaled $80, making my flight cost $260… BOOO! Spirit also charged for water on the plane and they had really bad customer service. I would have been better off paying more in the beginning and taking a more reputable airline. Don’t make the same mistakes I did! The only good news was that the seat belts fit, so I didn’t have to ask for an extender *shakes head*. 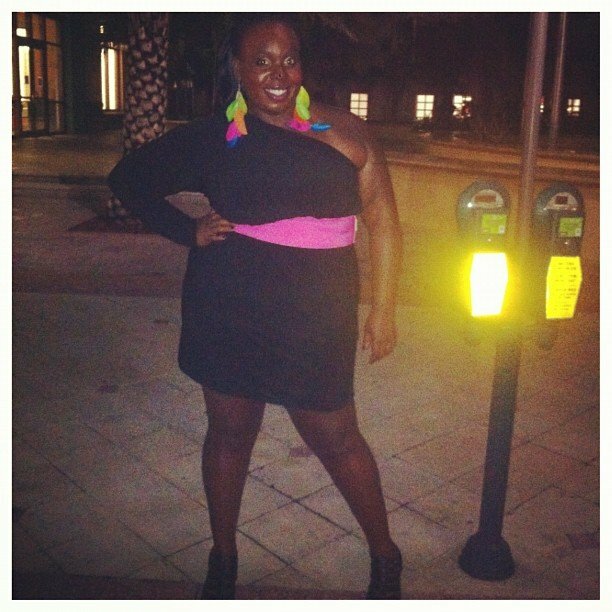 Once I got to Ft. Lauderdale, I had a great time. 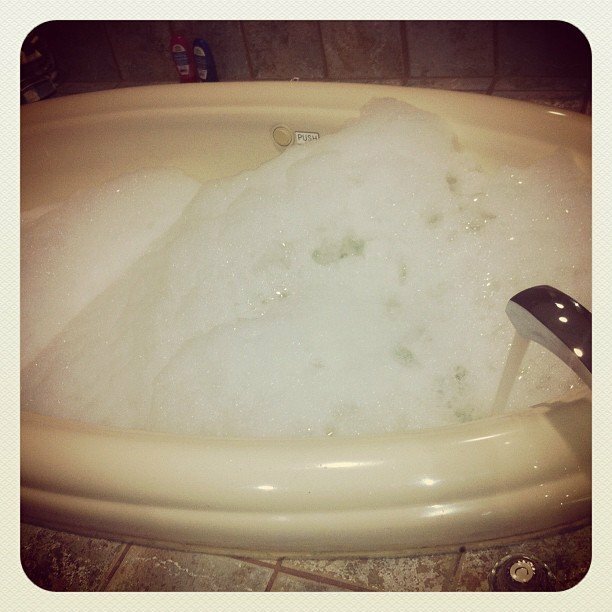 There was a HUGE jacuzzi style tub in my room so I was taking bubble baths constantly! That alone made me feel super relaxed. Now I’m back in NYC getting ready for my first meet-up next weekend (9/29). Its going to be an awesome night of live music, curvy conversations and giveaways! Hope to see all of you there… tickets are free so, register here! One of the cool things about not being anonymous anymore is that I can share ALL the aspects of my NYC life with you guys. If you’ve read TBGB for a while, you’ve heard me mention singing performances here and there. Music is a super important part of my life and a lot of my friends I know from performing. When I was in Los Angeles last week, I spent a few days with my good friend Jonathon Grant (aka @YourCoverBoy). Jonathon and I met studying Musical Theater in NYC. Now he’s doing well on the west coast acting and doing acousitc covers. Get two singers together for a few days and something creative is bound to happen… we started messing around with some of our favorite songs and did an impromptu mash-up/cover… here it is, hope you like it! Every time I take a trip I try to do something adventurous. 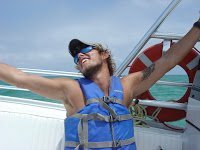 I’ve gone parasailing in miami, snorkeled with seals in La Jolla and each time that I do something like that I find that I conquer a fear of mine in some way. This year, when I went home for Christmas, I decided to conquer a fear that I’ve had forever– going places by myself. Its hard for me to have a cup of coffee on my own without a book or my laptop in front of me. So when I decided to take a trip to San Francisco on my own… I was beyond nervous. The first thing I had to do was make sure that I could travel in an affordable way, I did that using two of my favorite discount sites. Ideeli is primarily a fashion site that sells high end fashion at huge discounts. I love them because not only do they offer brands like Betsey Johnson and Rebecca Minkoff but they do regular “Plus Size Perfection” sales that are phenominal. A few months ago, they had an offering for a Travlocity.com gift card. The gift card was worth $100 but I was able to buy it for $50. I used the $100 gift card to book my hotel, so I was able to get 4 days/3 nights in the heart of San Francisco for $200! (This site is for members only, but you can sign up for Ideeli here). I am a Groupon fanatic! When I’m headed to a new city, I always sign of for groupon deals there. This trip I did something a little different though. I used the Groupon app on my phone and took advantage for “Groupon Now” deals for my meals. Groupon Now uses your GPS location to tell you what restaurants are offer discounts on dinner/drinks at that very moment. When I got hungry, I would see who in my area of San Francisco was offering a deal on lunch/dinner and if it was something I liked, I’d head over. It was a fun way to explore the city and find restaurants I wouldn’t know about otherwise. My favorite meal was at a restaurant called infusion, for $10 I got $20 in food and drinks (their edamame was AMAZING!) after a good meal and a glass of wine, my total was like $24. Score! (join groupon here). All in all spending a few days in a foreign city was a lot of fun. I think 4 days was the perfect amount of time. Thanks to everyone who gave me tips on where to go via facebook/twitter, I used a lot of your recommendations. Have YOU ever done a solo vacation? I swear, traveling as a Plus Size Princess is an art. There are so many opportunities for things to go awry; seatbelts not fitting… the person in front of you insisting on leaning back into your lap… and of course, the battle for the arm rest. Something that I’ve noticed is that what I wear can drastically improve the quality of my trip. Of course, when I fly home I try to wear things that will transition easily from frosty NYC weather to Sunny California temps, but there’s another reason I’m particular about what I wear when I fly. It may sound random, but soft flowing fabrics make fitting into tight spaces sooo much easier in comparison to denim and/or bulky sweaters. For this trip, my “flying outfit” came from Rachel Pally’s Plus Size White Label. Rachel Pally is known for making beautiful flowing pieces in soft cottons. This skirt of hers (below) fit all my criteria… it would work with leggings while I was on the east coast, but would be fine with bare legs once I got home. It wasn’t bulky either, so in a plane seat where every inch counts… I felt like I had the wiggle room I needed. I tucked a long sleeved top into the skirt, let the skirt sit high on my waist, wrapped a chunky belt around it and topped it off with a few (plastic/metal-detector safe) accessories. Side Note: I refuse to check luggage now that they charge a fee, I’ve been using this luggage by DVF and it fits all of my clothing even though its dimensions classify it as a carry-on. Love! 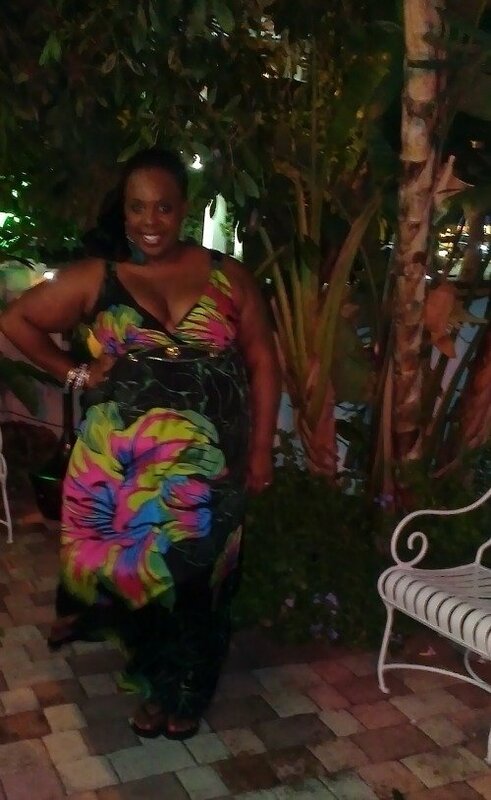 As I mentioned before, my Miami trip was my first “grown up” vacay. Instead of travelling with family, I was meeting up with girlfriends and I was pretty stoked. (It almost felt like my first time at sleep-away camp as a child.) I was in the LaGuardia Airport waiting for my flight when I passed a sign that simply said, “Life’s Good”. Sometimes I get so focused on the things that I’m not: I’m not skinny enough, I’m not making enough money, I’m not in a relationship… So, I decided in the moment that “Life’s Good” would be a personal mantra for me during my trip. I needed to remind myself that, in spite of all the things that I’ve yet to accomplish, life really is good. We decided to stay at the Miami Beach Resort & Spa because that’s where the wedding party was staying. I didn’t put much thought into it, the website looked nice and when I made the reservation over the phone, customer service was really helpful, but I was staying there mostly out of convenience. I was the first of my girlfriends to arrive and when I checked into our room it was around 2am so it was very dark. I opened the curtains to my room and could see the pool glowing a soft purple but that was about it. I unpacked, took a shower and went to bed not knowing what a gift our room was. A few hours later the sunlight woke me up and as I rolled over, the view from my window took my breath away. 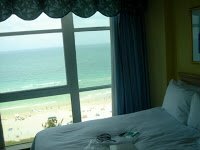 Our floor to ceiling windows were filled completely with the beach and the brilliant blue ocean. Life is good, I thought to myself with a smile. Within the hour, my girlfriends all arrived from California, Chicago and North Carolina, respectively. They checked in, we had breakfast in our room and then we threw on our swimsuits and headed downstairs. There was a small path from the pool area straight onto the beach, so we were there in no time and we spent the early afternoon talking, making business calls from the sand and playing in the waves. I’m not sure why laying around on the beach made us so hungry, but after a couple of hours we were ready for lunch (and drinks). We sat at the hotels outdoor cafe and Elida, who became my favorite waitress, brought us yummy sandwiches, quesadillas, chicken fingers (and drinks). As much as I hate to admit it, my weight is always a nagging issue in the back of my head. I’m so proud of myself for going parasailing and walking around in a swimsuit, but the reality is that for a fleeting moment I considered not taking this trip because Miami is a beach city and I’m no where near my goal weight. But from the time I saw that “Life’s Good” sign, I felt like there were constant reminders that life is meant to be enjoyed, period. There are so many things in this world to experience and if we miss out on them because of how we look… we’re crazy! Coming up from the beach and lunch, I was looking out my window and I saw a group of young girls huddled together in the kiddie pool. It was such a simple and sweet moment and for me it was a great testament to the range of people, single girls, families, honeymooners… and a Plus Size Princess who were taking a moment to recognize that Life’s Good. If there’s something you want to experience, don’t make your weight an excuse not to do it… okay? Its 3:30 in the morning and I can’t sleep so I thought I’d update you on where I am/what I’m doing. My girlfriend is getting married on Saturday in Miami, so we decided to make a long weekend out of it. When I go on vacation, its always with my family so this is my first “grown-up” trip and I plan on making the most of it. I had to get two things done before I came to Miami: 1.) Get a new bathing suit 2.) Get my first bikini wax. Lets start with the swim suit: I have some sites that I used to buy swimsuits in the past, but I wanted to try something different. I came across a site called SwimSuitsForAll and fell in love with a two piece halter tankini with a pink sash. I ordered it, it came last week and I love it! The built-in bra works really well and the pink sash is a really nice touch. You can order a variety of bottoms with this style so I decided to order a skirt bottom because I had some boy short-style swim bottoms already and I figured I could mix and match. I actually like the look better with my boy shorts, but its nice to have options for when I’m in a “I hate my thighs” mood. With my swimsuit taken care of, it was time to look into a bikini wax. I asked some of my friends about it and I got answers that ranged from “I love getting waxed, I do it every other month” to “Its a pain like nothing I’ve felt before and I will never EVER do it again!” So I really didn’t know what to expect. To be honest, I was more concerned because I wasn’t sure if my size would be an issue. 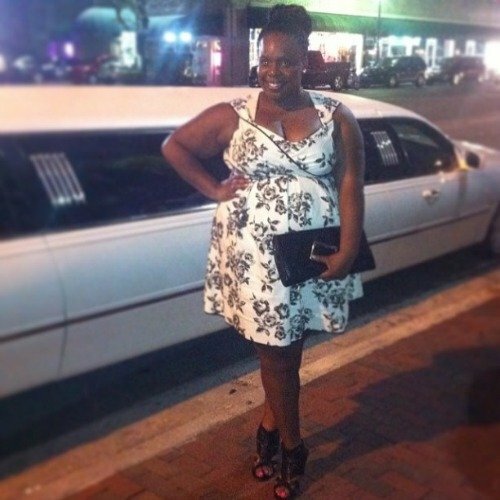 As a Plus Size Princess I have more… “nooks and crannies” than other girls and I was scared that maybe the waxing spa wouldn’t want to work around that. Anyway, I’m here at the Miami Beach Resort & Spa, the pool is glowing outside of my window, the ocean waves are rolling in under the moonlight and… I’m happy.